In the 18th century, carousels began to appear in Europe as part of fairs that traveled from town to town. At the time, adults went to fairs, not children. For a few dazzling, spinning minutes, riders could experience life on horseback — then exclusively the pastime of nobles and soldiers. The horses, built to be disassembled and reassembled for their own travels, were made of light wood and often in pieces. Look at early European horses and you may spot the hinges. Once you know the signs — the twist of the ears, their tails — you can also tell at a glance whether horses came from French, English, or German workshops. 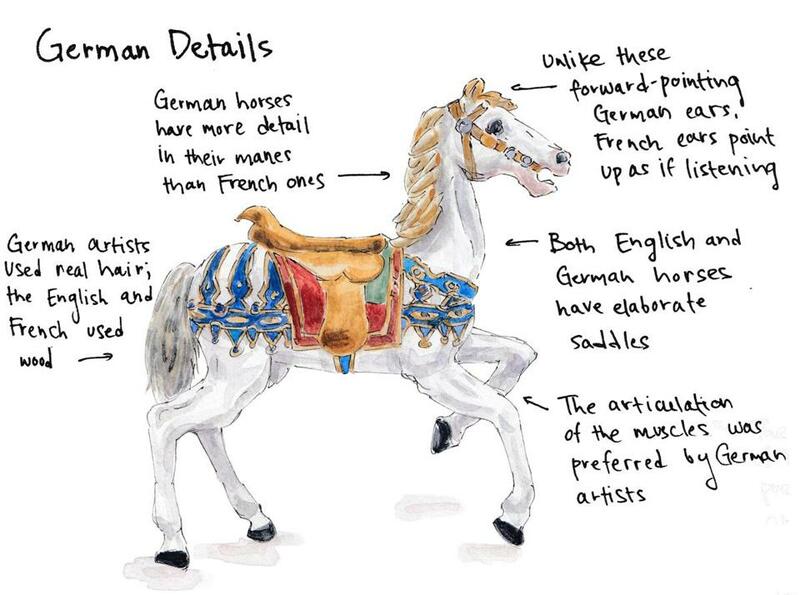 The Museum of Fairground Arts in Paris, which draws from the vast personal collection of Jean-Paul Favrand, a French actor-turned-antiquarian, helps sort out the differences: The Germans carved more elaborate, life-like horses. You can see the delineation of the muscles and the detail in their manes versus French horses, which are the simplest, with the smoothest-limbs and simplest trapping. French carousel horses are said to be listening because their ears point up; German horses’ ears are directed forward. Unlike English horses, both look out to the right. As English drivers would, English carousels have always traveled in the opposite direction. German tails are made of real hair, unlike French and English horses, which have wooden tails. The English went for lots of red and gold on the horses’ saddles and reins, and patterns tended to be floral. In the late 19th century, other animals joined the horses on parade. Again, the themes varied by region. The French went for the animals of daily life: rabbits, cats and cows, pigs, simple fish. The Germans went for the more fantastical creatures of their forests, magical creatures like sirens. The English were partial to roosters and modern political subjects. Brits could ride a Turkish general and their own politicians. In the 20th century, children begin to join their parents on carousels and child-size animals joined those sized for adults. It was the era of colonial expansion, and as people heard more about animals from Africa, like giraffes and zebras, these too appeared on rides. Times and tastes keep changing. Bicycles and cars have replaced horses as the aspirational means of transportation, and then there are planes. After World War II, Disney characters and all the other vehicles of modern life joined the circular procession. Meanwhile, of course, carousels came to North America. A lot of early American carousels were made by Jewish-German immigrants, so they tended to have the most in common with German carousels. But instead of traveling with fairs, American carousels stayed put in theme parks. That meant sculptors could use heavier woods, which supported even more elaborate carvings. They also added the animals of the American wilds, including pumas and bears. And then there was fiberglass, the lightness of which opened up all sorts of possibilities for artists. The Greenway Carousel’s menagerie is proof of that. Emma Jacobs can be reached at emma.clara.jacobs@gmail.com.